Good salmon always leads bliss, but this dish restores all faith in the world. Combine all the herbs and oil, season, mix and set aside. Place potato rounds in a single layer on baking sheet lined with an oiled piece of parchment paper. Season with s&p. Cover the potatoes with another piece of parchment paper and then press it down with a baking sheet of the same size. Bake in a preheated 400 degree oven for 5-8 minutes until barely cooked. Set aside. Take 1T of the herb mixture and spread evenly over the ‘skin side’ of the fish. Then evenly overlap the potato rounds to cover the fish and herbs to resemble ‘fish scales’. In a sauce pan over medium high heat add the butter, bacon, thyme and garlic. Render out the bacon and then add the wine. Deglaze and reduce. Add half the stock, the oatmeal and cook to about al dente. Add the rice and cheddar, stir and cook until the oatmeal has absorbed most of the liquid. Season with s&p and a squeeze of lemon juice. Over medium heat, combine all ingredients until reduced and flavours are well combined. Over high heat in a sauté pan add the oil and butter until smoking. Season the fish and place the salmon potato side down, sear. Spoon hot oil over top of the fish, do not turn the fish over (you want a dark potato crust) cook for 3-5, until medium. Set aside. 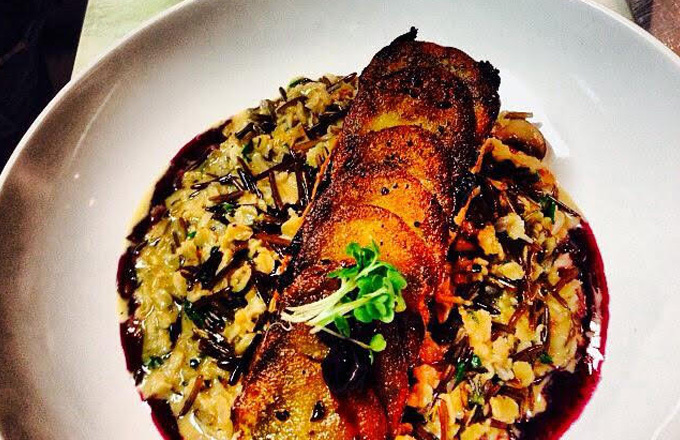 On a large dinner plate, spoon on 1 portion of the risotto, place the fish on top skin side up, and spoon over blueberry compote. Serve immediately.